[You can read my first review here]. I love coming here for some good ol'fashioned malts and shakes. 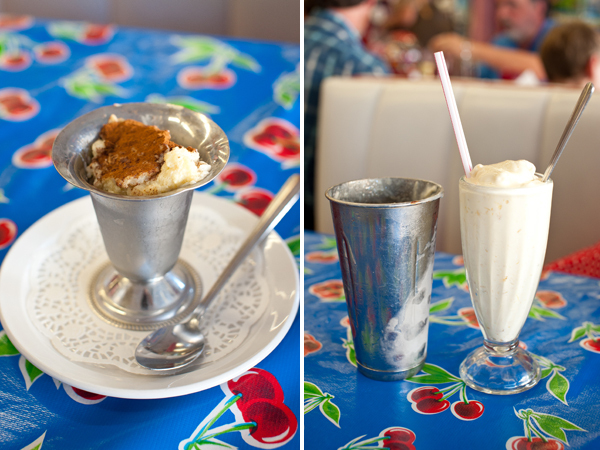 It's a diner in Old Town Orange - how does one resist? However, I have never gone for the food itself before despite the various times I've dropped by. I guess I just don't CRAVE diner food at the same times I'm craving a good malt shake. This time around, we had a Groupon though so it made it more convincing to snag a lunch there. So that we did. Well, Duc must not have gotten the lunch memo because he chose to go with breakfast via chicken-fried steak and eggs. Unfortunately, that was a bad choice. Neither of us liked anything on the plate. The eggs were bland and not well-scrambled. The potatoes were bland, too soft, and unappealing to the eye. The accompanying sourdough toast wasn't toasty and was drowning in butter. 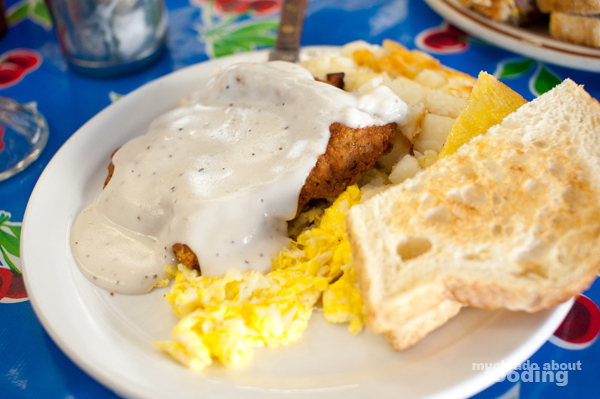 The chicken-fried steak was so thin and the batter soggy that it tasted like elementary school cafeteria food. I don't like saying bad things about food but that smothered in a tasteless gravy made for a disappointing breakfast-y plate. Perhaps it was an off day since it was ridiculously busy there that day but yeah, no bueno. 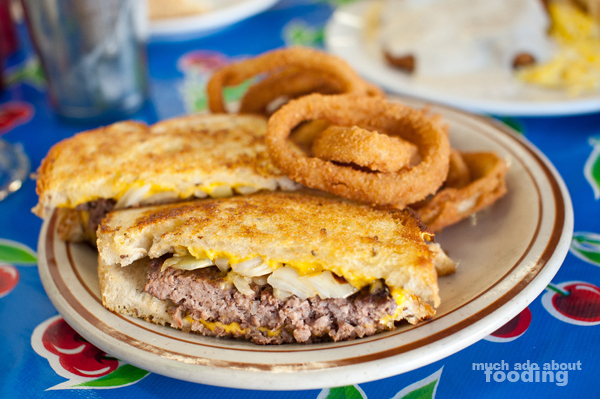 HOWEVER, they redeemed themselves with their patty melt (maybe they're better at lunch foods than breakfast?). This was so delicious and hit the spot so hard. The burger patty was juicy and thick. The cheese was melted to perfection. The onions were still white but just at that point pre-caramelization that still made them sweet. The onion rings as a side were over-fried but that didn't matter because the sandwich was large enough to keep both of us satisfied. Then of course were their desserts which I've always gone to them for. They did not disappoint with these; they never do after all! I ordered the homemade rice pudding which was very rice-y, something I did like as sometimes I see rice pudding too mushy. There was an abundance of cinnamon and certainly portion size. 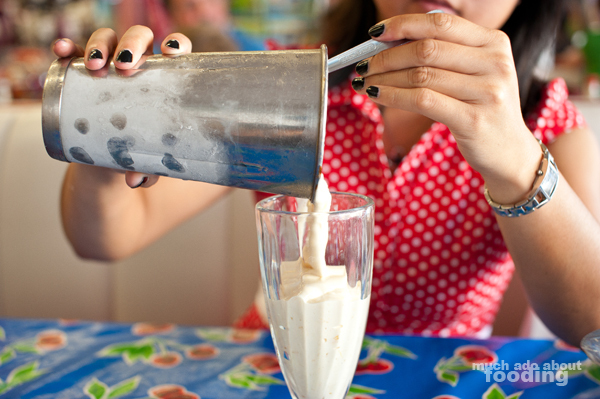 The same "problem" with portion applied to the pineapple malt shake which had more than enough for two glassfuls. It was creamy, it was pineapple-y, it was delicious. Desserts seem to be the way to go with Watson! After the Groupon, lunch with tip was $9. Not bad!